Showcasing Your Business to Achieve Results! I am thrilled at the opportunity to be able to showcase my business, Ignite Leadership International® at the Burnaby Board of Trade’s Showcase & Expo on May 25, 2017 from 2:30 – 6:30 pm. This showcase includes over 50 B2B exibitors, over 500 attendees to network with, and an oppotunity to particiate in three new seminars. Why is it important to showcase your business? As a small business, one of the major stumbling blocks to growing your business is lack of awareness by potential clients. People can’t do business with you if they don’t know you exist. Imagine that!! When you participate in a trade show event, or have a display table at a seminar or community event, you open up the doors and let people know you are in the marketplace. You never know who may walk by your booth or display and recognize how you can solve their problem. What is your goal in participating? I was in the unfortunate position of having to step away from my business for almost 8 months, Despite several attempts to return earlier, I was unable to speed my return. As such, my client base dried up when exisiting projects came to a conclusion during my absence. Although I faced a huge obstacle in rebuilding my business after this break, I was confident building new relationships and reconnecting with prior clients and colleagues would help fast track the process. Making a connection with as many business leaders as I can and sharing a bit of what I do became the focus of my efforts. Notice, my goal for the showcase is not to sell. Why? Because people want to business with people they know, like and trust. The showcase is exactly that. An opportunity to tell the 500+ attendees what is going on in my business world and what solution(s) I have to offer. Most businesses have a wide range of products and services they offer to customers. It is difficult to try and sell to everyone. Find out what kind of people will be attending the show and create a theme or focus that will appeal to a majority of those attending. You goal is to attract as many people to your booth as possible so you have an opportunity to make a great impression. If you don’t narrow your focus, you may look too scattered and they may rule you out! Have other materials not on display for other areas of your business to share if needed — better yet, get their card and offer to send the information by tomorrow. Once you know your goal, what next? or display table at all times during the trade show, or when display tables are open. You want to try to engage as many people as you can in short, inquiry style conversations. You want to learn as much as you can about them. Ask for their business card for a draw and record a few details about them on the card to help you in the follow-up after the show. Remember, at the show, you are the star and should shine! Collateral has a supporting role! It is important to have some collateral for you to share with attendees – flyers, rack cards, etc. I usually also have a calendar that allows me, and those helping in my booth, to book meetings (in person or phone) on the spot, where I know I have time available. Booking an appointment while you are front of mind with your potential customer helps you move along the know, like and trust scale faster. If you have a book or another small item people can purchase at the show that supports your theme/focus, by all means offer it for sale. Have lots of change in a cash box or use a web-based payment app to accept payments quickly and easily. Have someone available to process these transactions for you so you can focus on your staring role! It is important to interact with other exhibitors during slower times of the show. This offers two benefits. One, you can introduce yourself and your business – give them your business card. Secondly, you can learn about them and what they do, and obtain their business card. Look for opportunities to help each other. Do you have a similar target client? Do you have products/services which could align nicely and help both of you grow business? After each tradeshow, determine how much collateral was used, how many business cards you received in your draw, how many are good leads, and how many did you move along your sales funnel process? What was your return on investment? Like every staring role, its what comes next that can make or break the outcome! If you have collected a number of business cards or booked appointments, respond to every person within 24 hours or less! Yes, I said 24 hours or less! Have something new to share them. I frequently use an e-book or my chapter in “The Winning Way” or a recent article, tool or resource that reponds to the theme shared in my booth. Once you have made that initial follow-up contact, continue to work your sales funnel system to build a trusting relationship and hopefully move them from potential customer to current customer! Can we help you and your business ignite results? Book a complimentary Ignite Call and let’s find out. Isn’t It Time To Breakthrough? How high do you set your personal and business standards? Do you really reach for the stars and take actions to realize those goals, or are you more inclined to set more attainable goals that are “realistic” and less risky? For the most part, I set the bar pretty high for myself and I’m pretty committed to reaching and exceeding my goals and performance standards. This doesn’t come without a few challenges and set-backs but I haven’t stayed in business for over 25 years by always playing it safe. Over the years I have come to realize that most successful business leaders also set their goals high, take the risks and capitalize on the opportunities which move them forward toward these lofty goals. As a result they achieve what many believe to be exceptional successes. A mastermind group is one place where you can connect with other high achievers. The benefit of a mastermind group is how you can leverage the knowledge, experience and insights of other members of the group to drive your goals forward. A mastermind can provide a solid, safe place to face your fears, brainstorm ideas and celebrate your successes. One of my previous mastermind groups consisted of experienced entrepreneurs who had each been in business for over 5 years and were continuing to grow and develop into new areas. This success was reflective of success they achieved while in school and in their prior careers. In order to achieve your goals and dreams, each member of your group sets business and personal goals that will move you forward and allow us to grow. These are stretch goals. Stretch goals are commonly referred to in the business world as a way to achieve more. Stretch goals require a person or business to ambitiously extend itself beyond what seems realistic within current parameters. occur when you continually reassess current systems, standards and outcomes and then set the bar higher. Rejig to keep things current, and to maintain quality and performance — it also keeps life challenging and interesting! Elevating operations, goals, expectations and deliverables takes planning and dedicated effort. A Coach or Mentor or Mastermind Group can help make you stretch and achieve your goals by keeping you accountable. A VIP Day Strategy Session is another great way to gain clarity, stretch your goals and create the action plan you can implement immediately to reap the rewards of your vision. I challenge you to raise the bar in business and your own life and reap the rewards that follow. Catherine Rocheleau is a Leadership & Change Strategist and the Founder & CEO of Ignite Leadership International. We empower professionals and business owners to illuminate the excellence within themselves, their team and organization through team dynamics, communication and leadership. When you engage others business is more productive, profitable and your team is happier and more motivated. Subscribe to our bi-monthly newsletter where we share valuable articles, resources, and business insights. If you want to make a change, you have to know what it is you want to do. (Your Vision) To create a clear vision it’s important to step up and have an open mind for new opportunities and ways of doing things. This may take some time and energy but its time well spent! I have been working with my clients to create action plans so they can complete their project goals in a very tight timeline. The planning process has gone exceptionally well but sometimes it can be very challenging. This is where time spent gaining clarity in what you want to accomplish is so important. If you aren’t specific with the outcome, how can you plan the steps to get you there? I love the Deming Cycle as a tool for planning and executing projects. This management tool has four key phases… “Plan Do Check Act“. 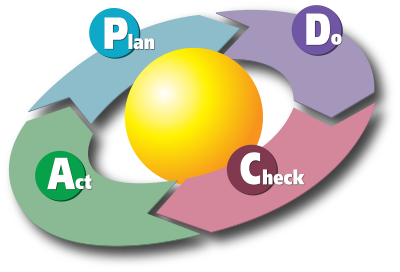 PDCA, also known as PDSA (Plan Do Study Act), offers businesses a proven method to control and manage the processes and systems within their organization for continuous quality improvement (CQI). Who doesn’t want to continually be more productive (get more done), be more efficient (use people and other resources better) and improve results (make more money)? Establish the objectives and processes necessary to deliver results in accordance with the expected output (the target or goals). By establishing output expectations, the completeness and accuracy of the specification is also a part of the targeted improvement. When possible start on a small scale to test possible effects. Implement the plan, execute the process, make the product. Collect data for charting and analysis in the following “CHECK” and “ACT” steps.Every time you create something new you want to test it. This is the purpose of this step. Test your new system, new program or product. Identify what’s working, what needs tweeking, what’s not working and needs to be fixed. Study the actual results (measured and collected in “DO” above) and compare against the expected results (targets or goals from the “PLAN”) to ascertain any differences. Look for deviation in implementation from the plan and also look for the appropriateness and completeness of the plan to enable the execution, i.e., “Do”. Charting data can make this much easier to see trends over several PDCA cycles and in order to convert the collected data into information. Information is what you need for the next step “ACT”. When you’ve been good at something one way its hard to change — Get uncomfortable, push outward and fulfill your full potential. To be competitive in the marketplace, or to fulfill the strategic plan for your business, it is important for you to lead yourself and your team through a clear process to achieve the results in the most efficient and productive way. Planning is often under performed. Create a definite plan for carrying out your desire and begin at once, whether you ready or not, to put this plan into action. A Coach or mentor is a valuable resource to help you become clear on what you want to achieve, understanding all the steps you must take to get there, and to identify which resources are needed. A Coach can also support you when things are challenging, and better yet, celebrate with you when you are successful!! They can be your confident, sounding board, resource and help you remain focused on your goal. We offer a “done for you” and a “done with you” option to fit your specific needs. Do you want to include our article in your blog or newsletter? I’m happy for you to share the content from this newsletter with one condition… you must include the following blurb as part of your post, with a link to our website. During the Ultimate Women’s Conference earlier in February, one of the sponsors had a sign that said “What’s in the rearview mirror doesn’t matter”. This got me to thinking about how so many people spent time thinking about the past and what could have been if only they had taken action. You can’t change the past but you can be the leader in your future. The cost of indecision and inaction can be huge! Only you can determine what that cost is to you. Here are 5 reasons that business leaders don’t take action. We all have 24 hours at our disposal. Time is not the issue. How we choose to use the time available is the issue. In business, time is money. I love this quote from Dan Kennedy. He says it so well. What can you accomplish in 10 minutes? Your Gremlin (that little voice that drives self-doubt, magnifies fear and forces you to second-guess yourself) can be very destructive. Change and growth both involve taking steps forward into the relative unknown. Planning is key to conquering this fear and will quite the Gremlin. Planning involves taking a large goal, breaking it down into manageable tasks and then taking small steps forward. As you take action, you review and reassess the results you achieve and rejig things along the way. I hear this so often. Planning takes time and I;d rather just jump in and move forward. In some instances your plan may not have to be written its just in your head and you know what steps you will take to get the desired results. Larger and more strategic goals will span a longer time period and frequently get derailed by day-to-day operations or “bright shiny objects” that look great but take you off course. Planning doesn’t have to take a lot of time – instead it takes some focused time. When you plan you want to think through the required steps and tasks and identify resources need as well as the who, what, where, when, why and how of what you want to achieve. Write down these plans either in a mindmap, a journal, a vision board, a spreadsheet or list. Once this is done you what to go back and look at this plan and measure your progress. We often don’t think about it but time is a resource, one that is frequently taken for granted. One key skill that is often underdeveloped and under utilized the is ability to delegate. Can you outsource some of your actions to a family member at home, a colleague who is more skilled or knowledgeable or a virtual assistant or employee? One tip to assist you is create yourself a “how to” document or operations manual that can be used by others to accomplish the tasks you need help with so that you can move on to other higher priority, higher revenue generating tasks. Invest some time in these resources and the results they achieve in meeting your desired results are far more likely and less frustrating for everyone involved. Delegation does not mean abdication. You will both be confident when you touch base along the way. If you really want something, you are more likely to put it on the top of your “to do” list and you will invest the time and money and other resources needed to accomplish that goal. Self-confidence, recognition of your own passions and dreams will help you along the way. If your mind becomes cluttered with other thoughts, and you spend your time doing other things, this is a signal that you need to reconsider this goal and determine if you want it bad enough. What is the cost to you if you drop it from the list? What would be a good replacement that you do want bad enough? Planning and time play key roles in achieving the success you want to achieve. Along the way, you have many opportunities to make decisions which will impact the end result. Keep your mind and eyes wide open and recognize when your Gremlin is getting in the way. Contact us today if you want to reach your full potential and make better use of your time and efforts. A complimentary Business Assessment Session can help identify your next steps. Book yours now. If you work in the business field, I am sure you are familiar with the need to find your unique value in the market place. Without this unique attribute, your business becomes part of the masses. It gets lost and goes un-noticed. We all want to have a strong competitive advantage over the competition! Standing out, offering unique value acts like a magnet to attract and retain customers. Given that a competitive edge is a strong “must have” to be a successful business, why is that so many entrepreneurs (and even large organizations) fail to clearly communicate and demonstrate their unique value as a competitive edge? Eban Pagan has coined value as the “universal human blindspot” — that attribute which costs businesses the most! Failing to communicate and provide value to your customers is a huge drain on your revenues and profitability. Knowing and understanding your value, and then establishing communication strategies to share your value with others is key. How can you do this…. create a clear plan! Planning frequently falls by the wayside in business endeavours even though it is so critical. 1. An annual review is the first step. As a business leader, setting aside time to plan for your business. Whether you take your team or a portion of your team on a retreat, create a strategy session with your board of advisors or your Coach, or create a solo-retreat it is important to focus solely on all aspects of your business. During your retreat/strategy session, you want to exclude all external and day-to-day distractions. Host this retreat away from your work place, away from the phone, emails and other distractions. You want to use this focused time to identify where you are now and where you want to go, what’s working, what’s not, what would you like to change, what needs to be up-dated or eliminated. HR, finances, marketing & promotion, operations and research are just some of the areas to investigate. Don’t forget to evaluate your position in the marketplace, and where your competitors are too . A SWOT analysis is a great tool to assist with this. 2. Planning for the future is next on the agenda. or… struggling to plan but sometimes just don’t know which direction to go. Planning provides competitive edge to the enterprise over the others which do not have effective planning. This is because of the fact that planning may involve changing in work methods, quality, quantity designs, extension of work, redefining of goals, etc. With the help of forecasting not only does the business secure its own future but at the same time it is able to estimate the future motives of it’s competitor which helps in facing future challenges. Therefore, planning leads to best utilization of possible resources, improves quality of production and thus the competitive strength of the business is improved. He who every morning plans the transaction of the day and follows out that plan, carries a thread that will guide him through the maze of the most busy life. But where no plan is laid, where the disposal of time is surrendered merely to the chance of incidence, chaos will soon reign. If you need help with your annual retreat (as a group or as a solo-preneur) I’d love to assist you. With more than 20 years as a profitable entrepreneur, I have walked this path, and as a Coach I have helped others do the same. Contact me so we can discuss how we can work together! PS…. consider joining my Hit the Ignition Switch summer quickstart program… it’s a great way to start the process. Bring a Friend Special ends June 9th, 2013 at midnight … so don’t delay! In my March 30th post, I spoke about the top three excuses people use to avoid spending the time and energy necessary to plan for success. In continuing on the planning theme, I will explore the benefits of planning and how they can push uncertainties to the sidelines. I frequently make the analogy between a road map and the plans created in business. Your vision is the destination and what will be achieved when the implementation plan (your business road map) is successfully executed. Failure to execute a project well can be a major obstacle for a business leader. Failing to execute can result from a lack of clarity of what is to be done, lack of understanding on how to implement steps, or procrastination or even fear of failure. Your plan provides the clear direction that you and your team require to effectively and efficiently move a project forward. It will also keep you focused on where you are at any point in time and able to celebrate the successes as you hit key milestones. Whenever you decide to implement a change, the decision is accompanied with some risk. What happens if the changes are not successful? What happens if… the cost savings are not realized? …or the profits aren’t increased? … or staff fail to be more productive? Business leaders must learn to identify information quickly and effectively and make decisions with the information they have at hand. Waiting too long can be costly in time, resources, and outcomes! Making a decision too quickly can also be detrimental. Planning reduces uncertainties by forcing you to look at what is on the horizon and anticipate these events. You can then take steps to act, mitigate risk or change direction. Part of the planning process should include a risk assessment. What are known risks? What are the limiting factors? What steps would mitigate the risks? How do the risks change when variables are modified? Risk is further mitigated when you use any new information that becomes available to reevaluate your action plan and either stay the course, stop, or change direction. Your plan is a working document but when you have taken the time to think through the risks and limiting factors associated with each stage, the need to make major changes should be all but eliminated. Every change will have something pop up that was unexpected, or deemed to be a low or negligible risk. As such, detours may be needed and the plan must be altered. A change in direction can be viewed as a set-back or part of the change process. It can also be viewed as an opportunity to make improvements or incorporate new options into the plan. How will you react to the need to change direction? With a strong plan, your ability to make informed decisions improves, which increases your success rate. If you are ready to examine your business strategy, plan a new project, review systems and processes to improve efficiencies or implement changes to grow your business… contact me. Let’s explore how my consulting, project management or coaching programs could help you. Do you take time to plan your projects, goals or do you just “wing it”? Do you write down your goals, action plans and the desired results or just keep them locked in your head? Create a definite plan for carrying out your desire and begin at once, whether you are ready or not, to put this plan into action. Planning offers every business leader or professional many benefits … yet so few actually take the time to plan appropriately. In this post we will explore 3 common excuses used by business leaders for not planning. 1. Planning takes time I don’t have. This is the most common excuse given for why people do not plan. Planning does take time but the reason people don’t make time to plan isn’t because they don’t actually have time. Instead, they don’t value this step in goal achievement because they have failed to make the connection between creating a strong plan and long-term success. There are ways to minimize the workload and feel great about the process. The great value is in the process of discovery, not the end result. A business coach is a great resource to help you create a solid plan. Together you can brainstorm, discuss and explore options to improve your ultimate success. Your coach also becomes a great accountability partner during the planning process. Many people believe they have a clear plan in their head and therefore they do not have to write it down. Others reject being kept accountable by someone other than themselves and therefore resist writing down their plan. They also resist writing it down because things change and therefore the plan would be out of touch with reality. Life and business are full of constant changes, distractions, opportunities and challenges. In any given day you can easily become focused on what is right in front of you and lose sight of your longer term goals. A solid implementation plan is the tool which will help ensure you keep your eye on the true goal. It is a living, breathing document which needs to be reviewed and tweaked when and where necessary based on outcomes or new information. Your implementation plan provides the road map that will guide you toward your long term vision. It helps ensure your long-term success. One underlying factor that may or may not be recognized is the fear of failure. Creating a written plan sets your course and the results you want to achieve. Your plan identifies the steps you will take, who is accountable, and the timelines for completion. Interestingly enough, a written plan increases your chances of success — completely the opposite to why many people don’t want to create the plan. Contact me for your complimentary Exploration Session. We will explore how I can help you create your plan and successfully reach your long-term vision! You can change your mind at any time by clicking the unsubscribe link in the footer of any email you receive from us, or by contacting us at sales@igniteleaders.com. We will treat your information with respect. For more information about our privacy practices please visit our website. By clicking below, you agree that we may process your information in accordance with these terms. We love meeting new business professionals. We offer a 30-minute complimentary Ignite Session to discuss your goals and to determine if we have a solution for you . Sign up for your session today. Copyright © 2019. Ignite Leadership International. All rights reserved. Ignite Leadership International is a registered trademark of Catherine Rocheleau & Associates Inc. All other registered and un-registered trademarks are the property of their respective owners.